Lightly sweet peppery with notes of citrus licorice. Good anytime. Combines Ginger, Tulsi (Holy Basil), Cinnamon, Anise, Orange + Apple pieces, Star Anise, Pink peppercorns, Orange slices, and Safflower Petals. Cup Characteristics: Lightly sweet peppery with notes of citrus licorice. Good anytime. 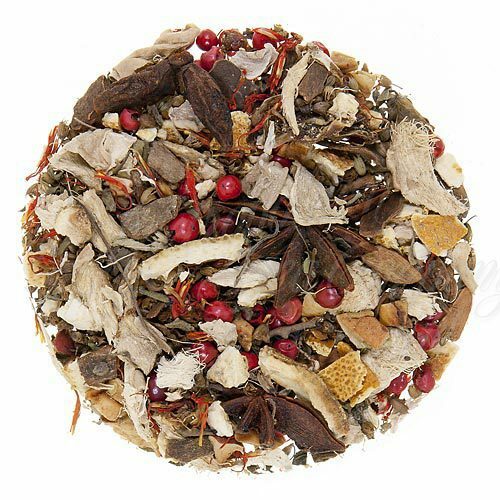 Luxury Ingredients: Ginger, Tulsi (Holy Basil), Cinnamon, Anise, Orange + Apple pieces, Star Anise, Pink peppercorns, Orange slices, Safflower petals, Natural flavors. In Hinduism, Tulsi (Latin: Ocimum tenuiflorum) is regarded as the holiest of all plants. Like the threshold of a doorway, it is believed to be the point where heaven meets the earth. In fact, a traditional Hindu prayer maintains that the creator-god Brahma resides in each of its branches. To say they regard Tulsi as a plant of great power is an understatement. In addition to its spiritual characteristics, Tulsi is also prized for its ability to restore and fortify the body. According to natural health and Ayurvedic practitioners, tisanes made from the leaves of the plant are said to boost immunity, acting as an antibacterial element that can protect the body from cold and flu, easing fevers and headaches, and relieving sore throats and coughs. To boost flavor, and add an additional layer of antioxidants and polyphenols to the tried and true kadha recipe, we’ve added in a host of additional spices, dried fruits and flowers, all selected for their zip and rich character. The resulting brew, Zesty Tulsi, is truly one for the ages. Brew a pot and say a prayer for Brahma. We believe he’d be most pleased. Hot Tea: Bring filtered or freshly drawn cold water to a rolling boil. Place 1 teaspoon of herbal tea for each 7-9oz/200-260ml of fluid volume in the teapot. Pour the boiling water into the teapot. Cover and let steep for 5-10 minutes according to taste (the longer the steeping time, the better the flavor as more fruit and herb flavor is extracted). Garnish and sweeten to taste..
Iced Tea (1 L/Qt): Place 12 slightly heaping teaspoons of herbal tea into a teapot or heat resistant pitcher. Using filtered or freshly drawn cold water, boil and pour 1¼ cups/315ml over the herbal tea. Steep for 5-10 minutes. Quarter fill a serving pitcher with cold water. Pour the tea into your serving pitcher straining the tea or removing the tea bags. Add ice and top-up the pitcher with cold water. Garnish and sweeten to taste. A rule of thumb when preparing fresh brewed iced herb & fruit tea is to increase the strength of hot brew since it will be poured over ice and diluted with cold water.